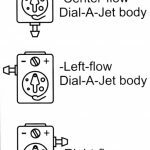 Dial-A-Jet feeds a fine consistent mist of emulsified fuel instead of raw liquid fuel like all other jetting circuits in your carb. It’s the easiest and fastest way to “tune-in” any modifications you have performed on your machine. !!! NOT legal for sale in California on pollution controlled motor vehicles except on vehicles used for closed course racing only or in other states where similar laws apply. 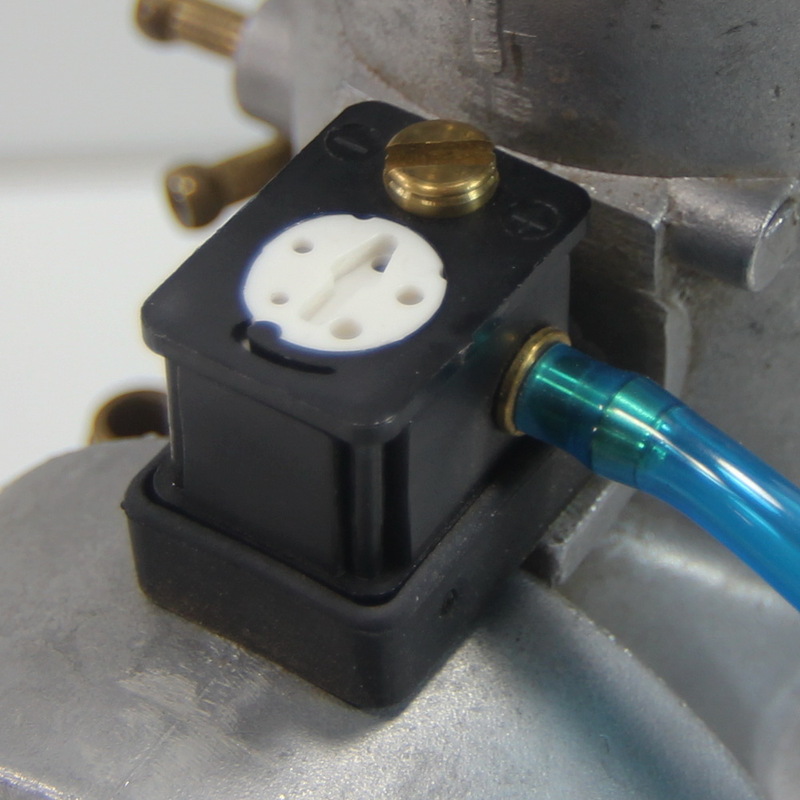 Dial-A-Jet fits any brand, size and style of carburetor with a float bowl. 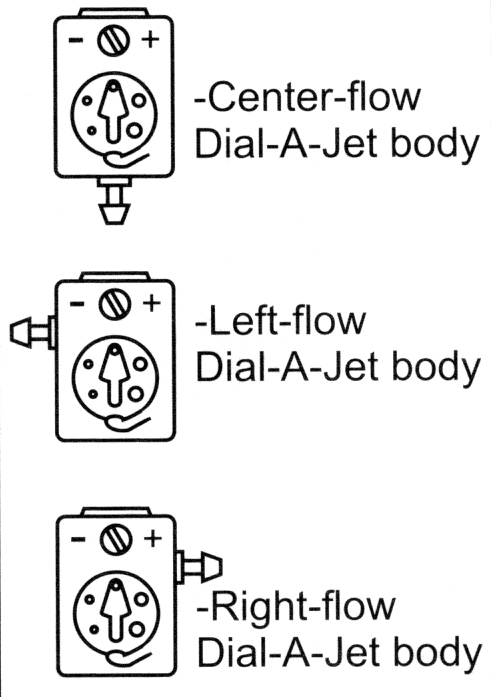 Dial-A-Jet is like adding fuel injection to your carburetor that you can richen or lean by turning a dial. Sick and tired of changing jets? Dial-A-Jet will take care of this problem and a whole lot more! Why change jetting? Some people don’t! Your engine will lose 10% to 15% of total horsepower with improper jetting. A 100 HP machine will make 85 to 90 HP. The simple fact is that changing jets is not a pleasant task and takes a lot of time. Now you can run at peak horsepower all the time whether your engine is stock or modified. The best part is that jetting is quick, easy and accurate with Dial-A-Jet. 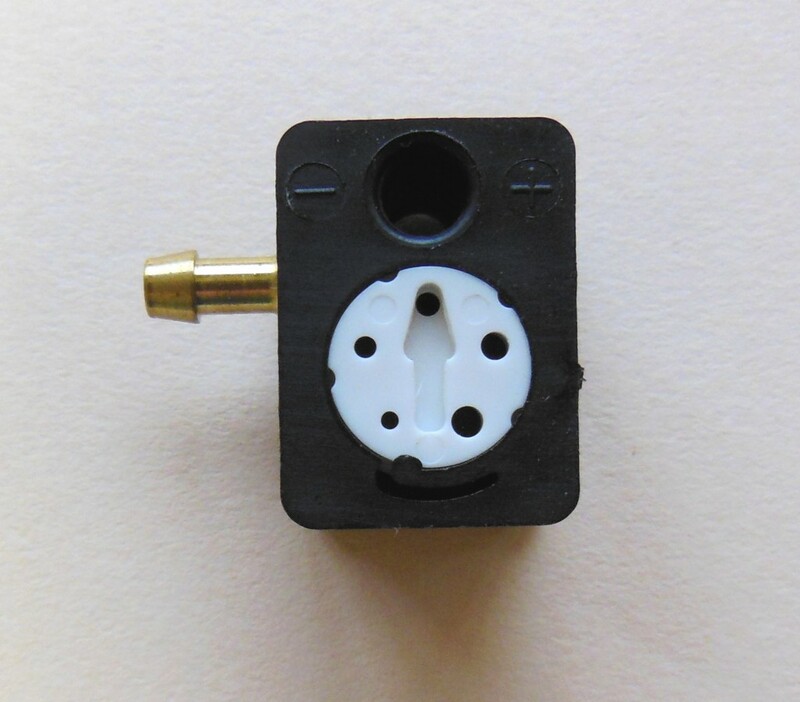 Dial-A-Jet fits any carburetor; Keihin or Mikuni, round slide, flat slide or butterfly, and is easy to install. 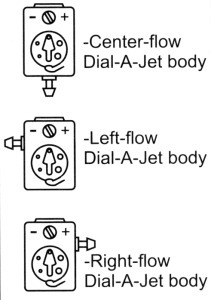 Dial-A-Jet IS NOT like a Power Jet. A Power Jet feeds raw liquid fuel, just like the other circuits. Dial-A-Jet feeds emulsified fuel for instant throttle response and works from just above idle to full throttle. Dial-A-Jet feeds a fine consistent mist of emulsified fuel instead of raw liquid fuel like all other jetting circuits in your carb. Pre-atomized fuel weighs 10% of what raw liquid fuel weighs, therefore, it is very responsive to engine needs. Dial-A-Jet gives you great throttle response. The emulsified fuel is delivered to the engine instantly and acts as an intermediate circuit until the heavy wet fuel from the other circuits catch up. Dial-A-Jet emulsified fuel charge fills in the lean spots between the poorly atomized fuel molecules from other jetting circuits eliminating lean spots. The lightweight fuel charge follows the path of least resistance, a law of physics. This gives you a consistent, even fuel supply at all engine RPMs. Dial-A-Jet allows you to run at peak HP at all temperatures and altitudes. No other product does this at any price. Dial-A-Jet is the easiest and fastest way to “tune-in” any modifications you have performed on your machine. From pipes to porting, Dial-A-Jet makes it work right. 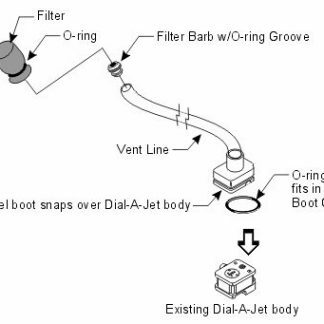 Dial-A-Jet will make it easy to jet a piped engine correctly with less fuel on the low end for crisp throttle response. Dial-A-Jet will automatically raise the fuel curve as the pipes kick in, giving you a perfectly calibrated engine from bottom to top. Dial-A-Jet is a great protection against burn down due to its ability to feed fuel accurately based on the engine’s demand. 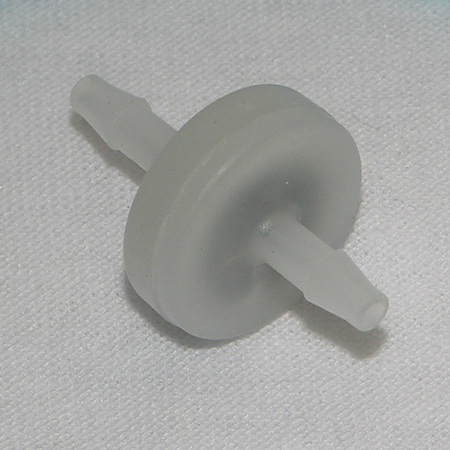 Dial-A-Jet consistently purges your float bowl of moisture (water, alcohol or benzenes) as they settle to the bottom. This eliminates water seizures or burn down, carburetor icing, galling or broken intake skirts on your piston. 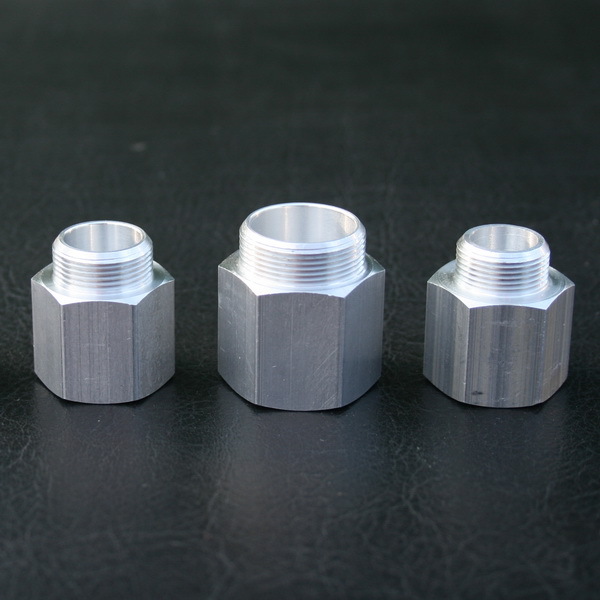 Dial-A-Jet eliminates detonation/pinging and compensates for poor fuel quality. Dial-A-Jet allows you to re-jet your entire engine (single, twin, triple or four cylinder) in about one minute. Dial-A-Jet allows you to tune each cylinder individually for maximum performance. Dial-A-Jet improves fuel efficiency 10% to 20% or more. Dial-A-Jet has no moving parts or complicated electronics. It works every time, all the time. Learn more here: About Dial-A-Jet. We all buy snowmobiles for a certain level of performance whether it’s a 50 HP sled or a 100 or 125 HP sled. You can easily lose 15% of your total horsepower with improper jetting. The jetting can be wrong for a number of reasons. Temperature and altitude play a major role. To really stay on top of your performance, you need to rejet approximately every 10o temperature change or every 1000 feet of altitude change. Ask any racer – they rejet more often than this. It’s really amazing that some consumers will run out and spend $300 to $700 for a set of pipes that produce a 10% to 15% increase while ignoring the big loss of horsepower due to poor jetting, not to mention the fuel mileage loss. In defense of riders that do this, we realize its 1997 and certainly no fun to take your carburetors apart repeatedly, especially with that crowded engine compartment. Get a set of DIAL-A-JETs!! 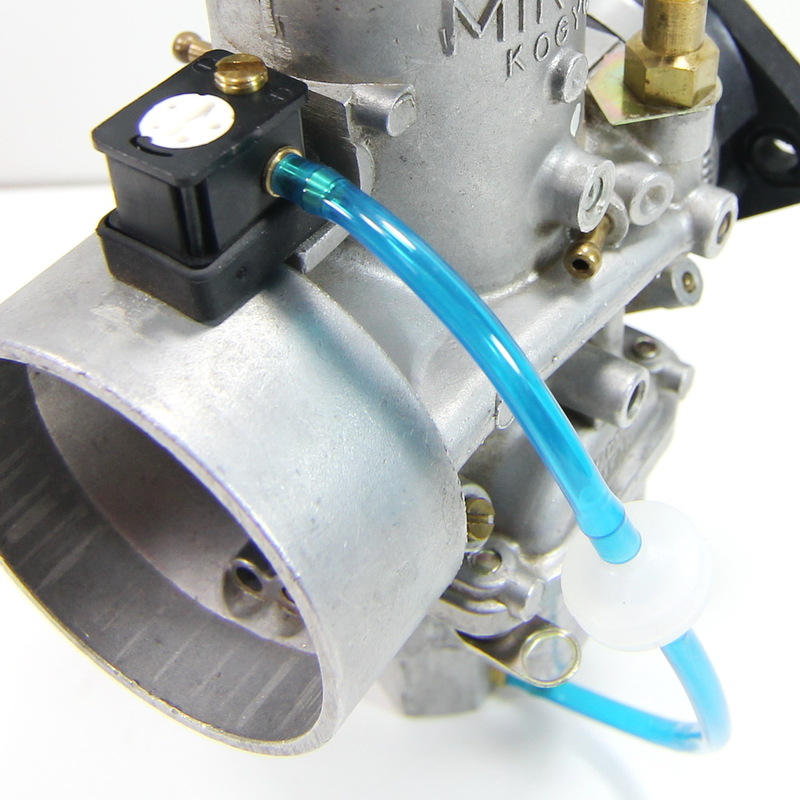 They are inexpensive, work extremely well, and are very reliable as well as fitting on any carburetor or sled. It’s the new Millennium – if you really want performance, get a set of Dial-A-Jets.